A professional premiere West Coast service provider with National and International experience. 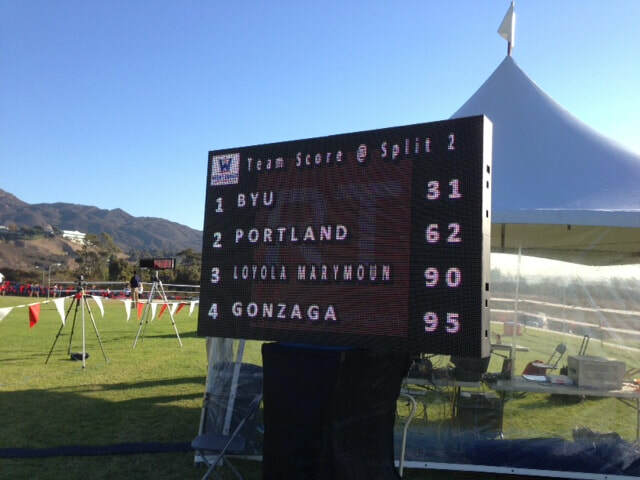 A first developer with true live split scoring in cross country. 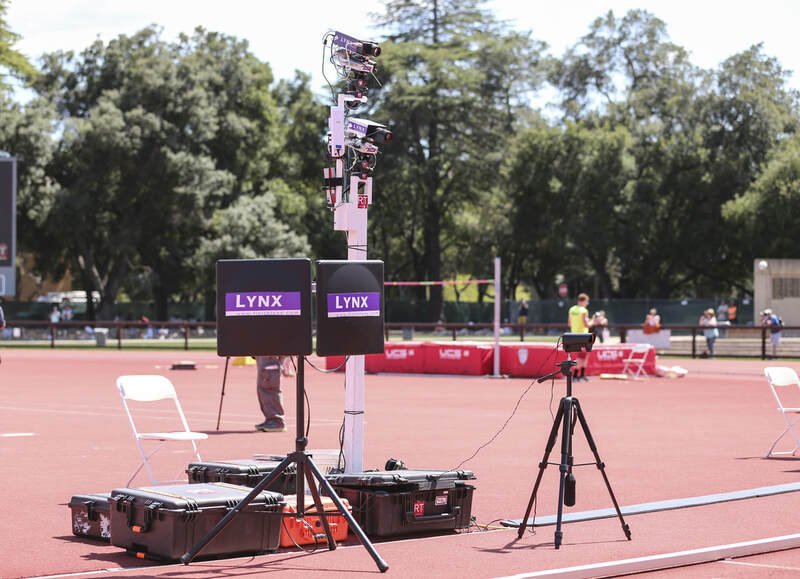 The pioneer of the Cross Country Triad of FinishLynx, IdentiLynx and Ipico RFID Integration. 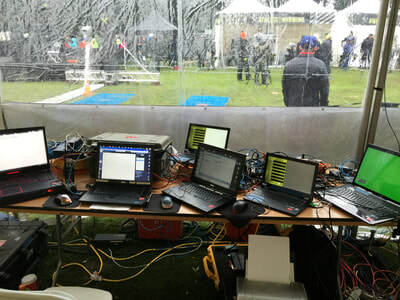 "A" team only technicians assigned to your event. EtherLynx PRO Super High Resolution, EtherLynx Fusion, and EtherLynx Vision cameras. 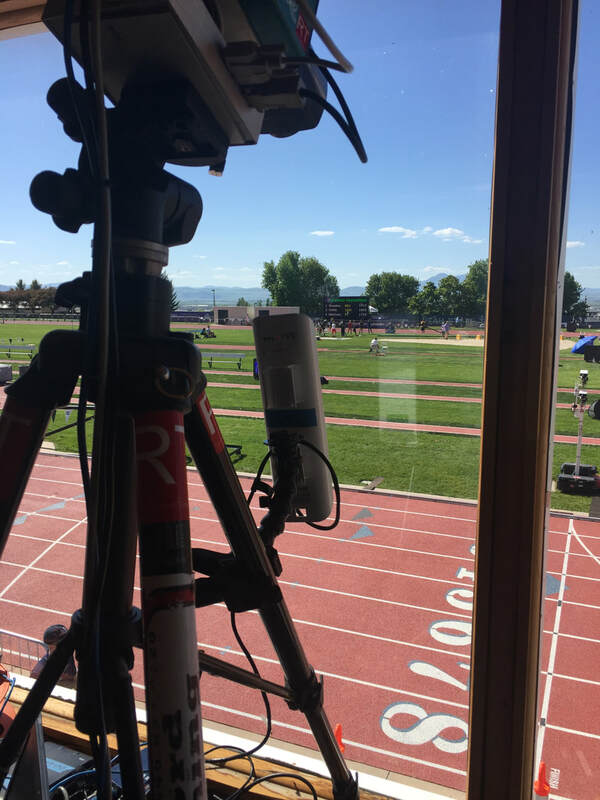 A large inventory of cameras allows for multiple finish lines to be timed for wind reversals and other applications such as en route 1500m, 3000m, etc. Finishlynx Identilynx full frame time synchronized cameras that integrate with FinishLynx line scan cameras and RFID Chip system technology. All events include 2 independent systems per finish line for full redundancy. 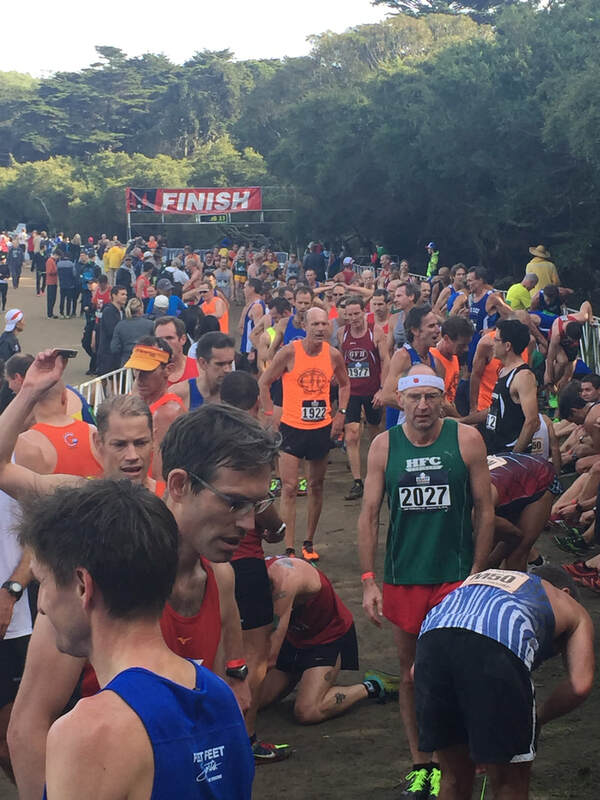 Chips on bib numbers, shoes or ankles (with neoprene straps) Disposable or returnable. In-house disposable chip printing and encoding to save you money. Can theoretically be deployed and operated world-wide. 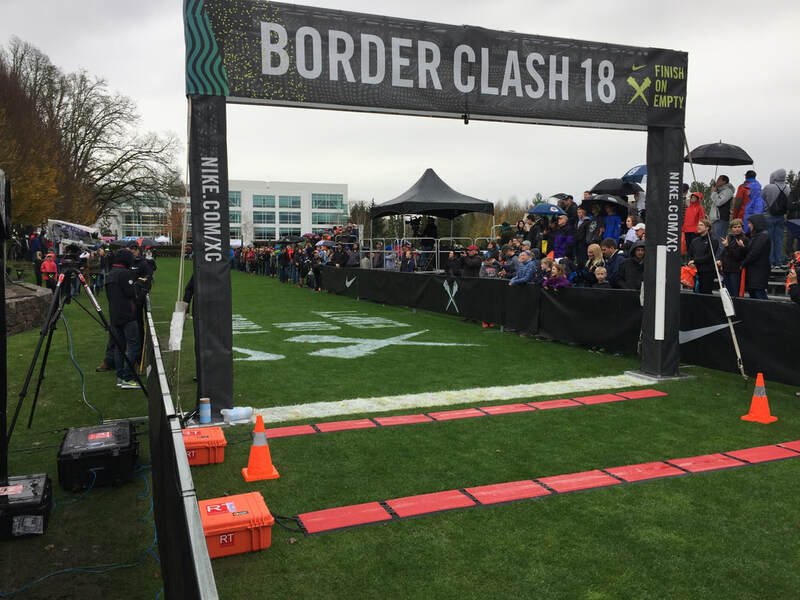 This information can be sent in real-time to announcers, video displays (via ResulTv), Record Timing’s various Galaxy display boards and 10mm full color video boards, Text messaging, Twitter, Facebook, Internet and Broadcast HD television and web casts. 10mm full color video boards, Text messaging, Twitter, Facebook, Internet and Broadcast HD television and web casts. 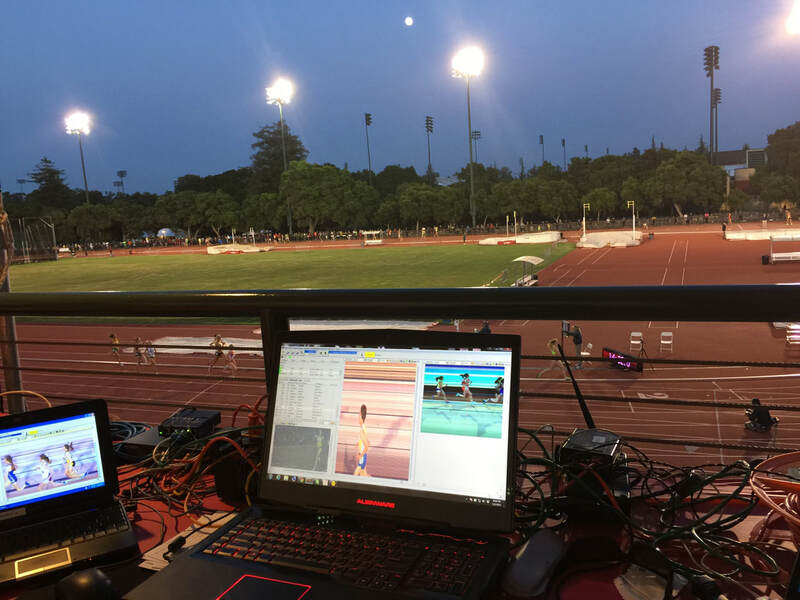 HD broadcast quality data crawlers, running clock, splits, scores and results. 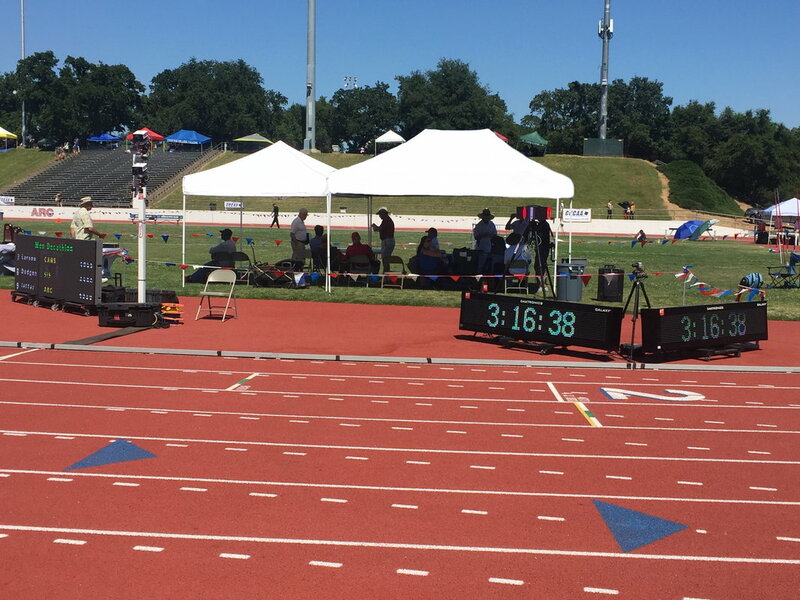 Database operation and integration with Hy-Tek’s Meet Manager, Direct Athletics’ Meet Pro, and Run Score. Printed and electronic (html, pdf, text) results provided to event management. Beneficial for very large events. 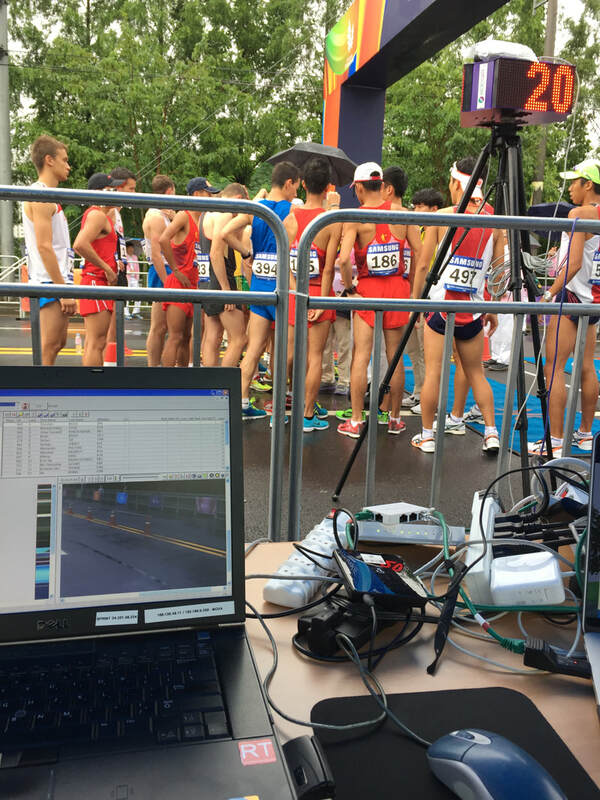 Road race participants can easily look up and print their results after finishing. 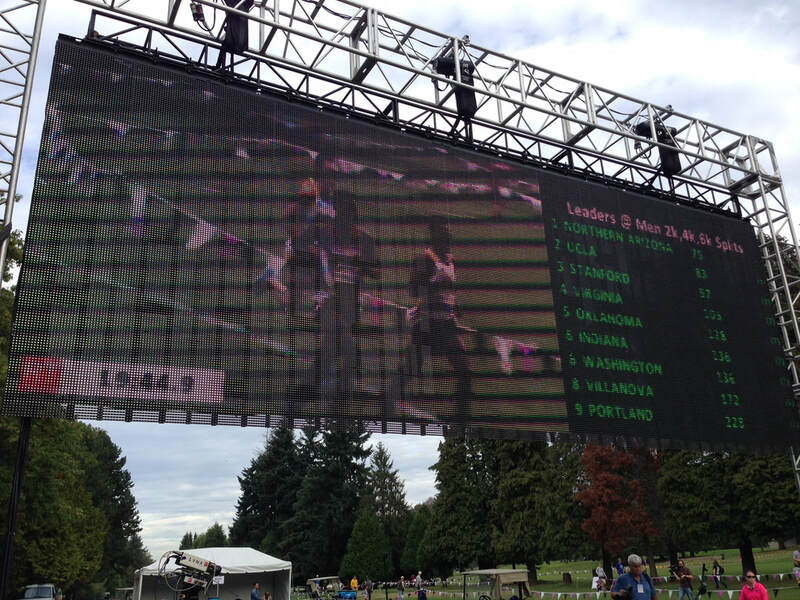 Live enroute XC Splits and team score via AthleticLIVE or in-house system internet data posting during races. No app to download or install. Web based on-line entries set up. 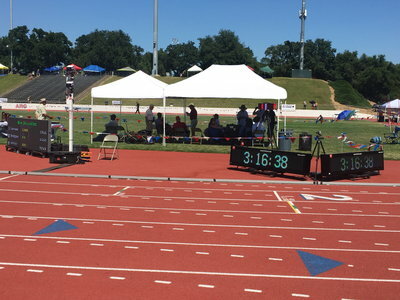 Realtime / Live Results during the meet on Record Timing’s web site. Multiple redundant web servers for load balancing of high web traffic events. 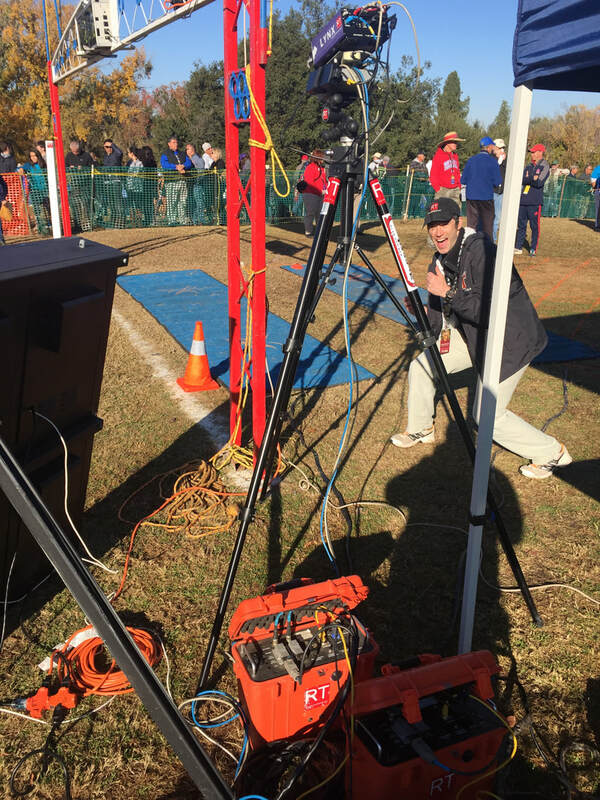 Live XC Splits internet data posting during races. 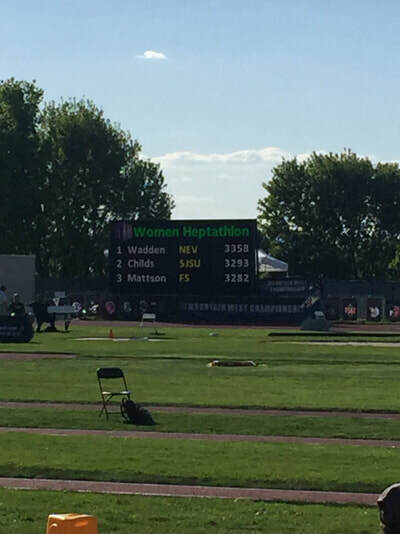 Live splits stats (for multi lap races) and live field event stats (attempt by attempt and overall standings). Graphical (for announcer display CIS) and web based attempt by attempt Live field event results. Web posted compiled results and TFRRS uploads before leaving the venue. 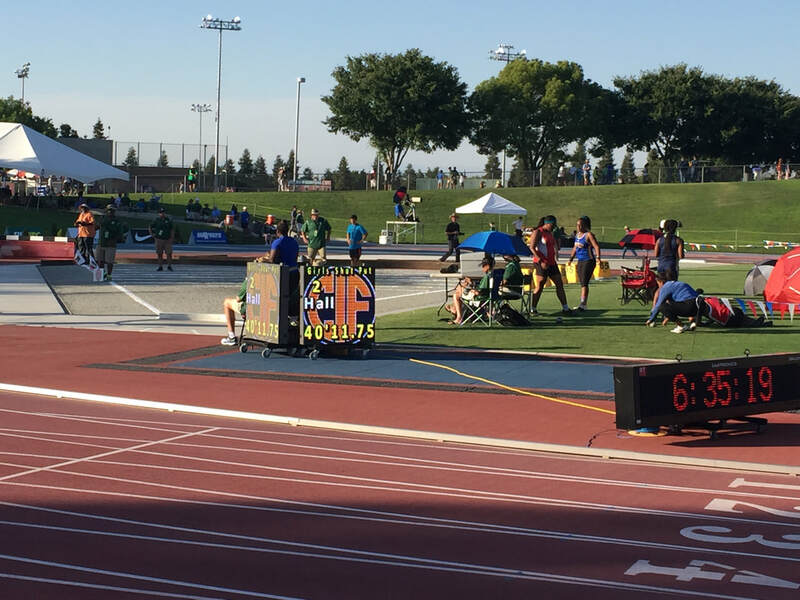 Web posting of meet information, time schedules, entry lists, etc. Simplified and easy to navigate results pages interface for quick results via web enabled cell phones. Live Twitter and Facebook updates. 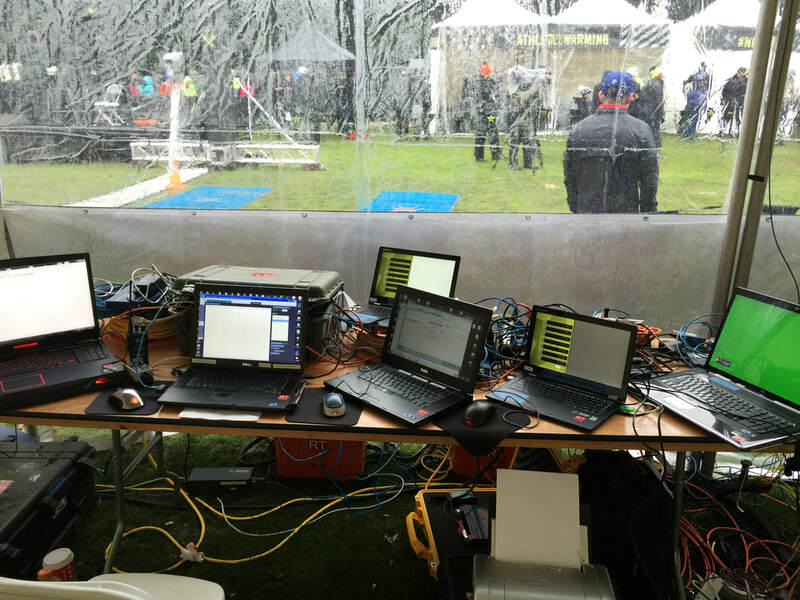 Ensures that Record Timing is internet connected for your event. An inventory of up to 50 display boards of various configurations. 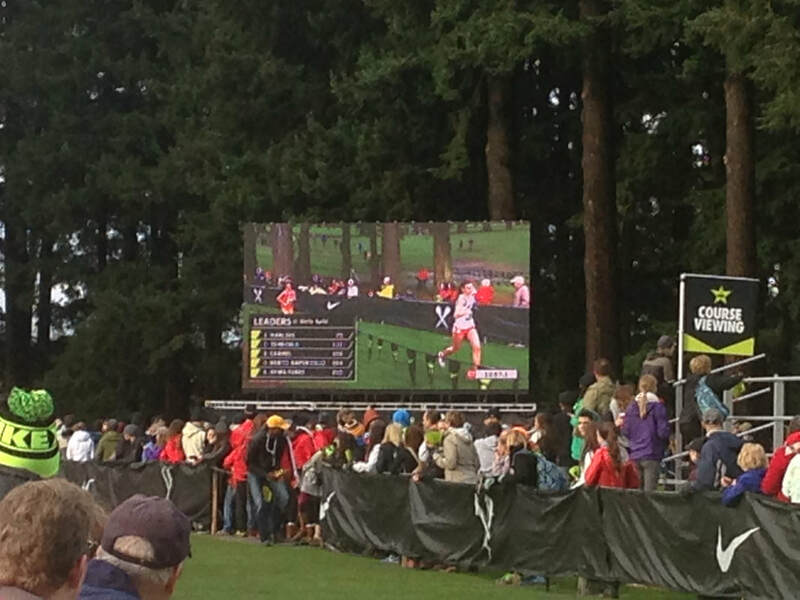 150 square feet of video (Live camera feeds to or scoreboard results). 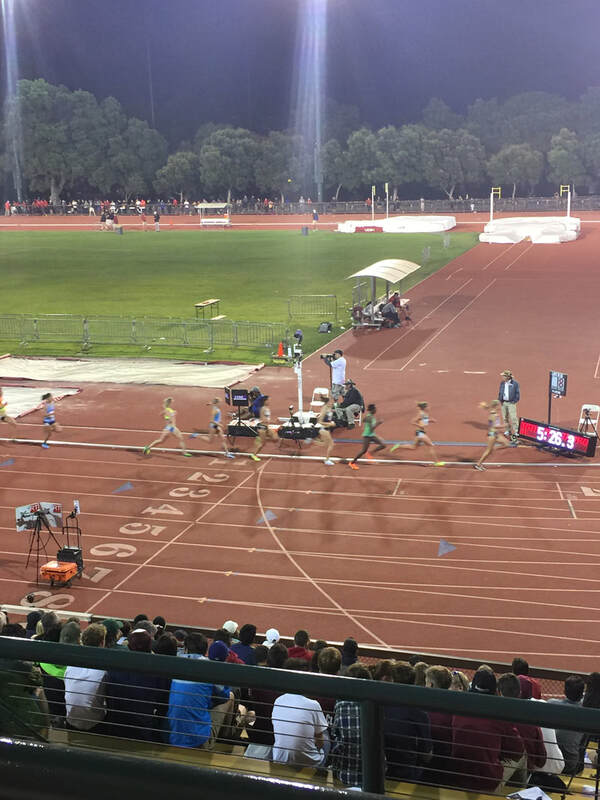 Running time, quick time, start lists, results. Start lists, name, current rank, current attempt, metric to English conversions. In-house Scoreboard and video board integration. 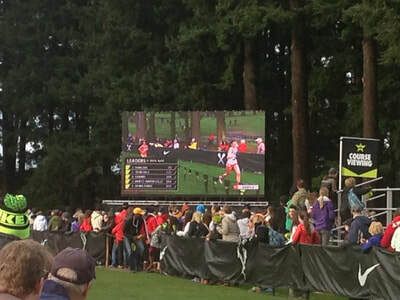 Includes live running time, split times, start lists, wind readings, team scores and results via ResulTv graphic display. This is a live dynamic feed of results to the internet. Allows one to view race (team and individual) progress on the web. Live splits stats (for distance races) and live field event stats (performance by performance/round by round). These are used to administer field events electronically as well as they can also be used to drive spectator display boards --automatically giving Place and Name with Metric and English mark conversions. ReacTime False Start Detection system which includes block sensors and UCS blocks (if needed). Interfaces directly with FieldLynx, result display boards and database. 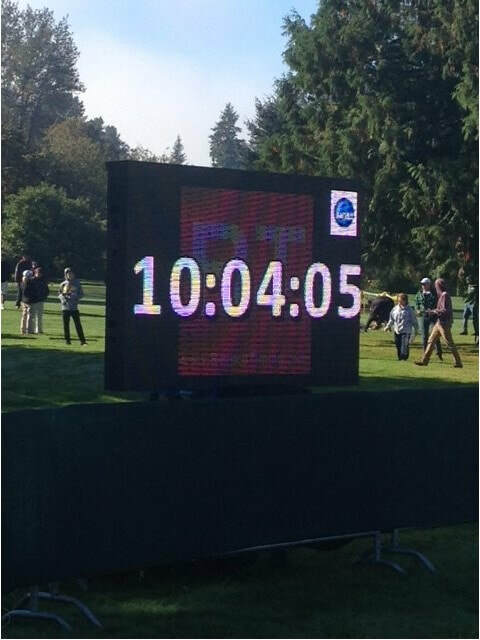 (eliminates the need for an official to operate it). 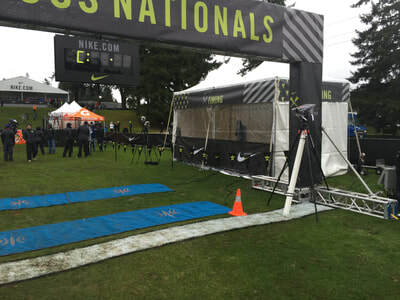 Additional wind gauges available for jumps. 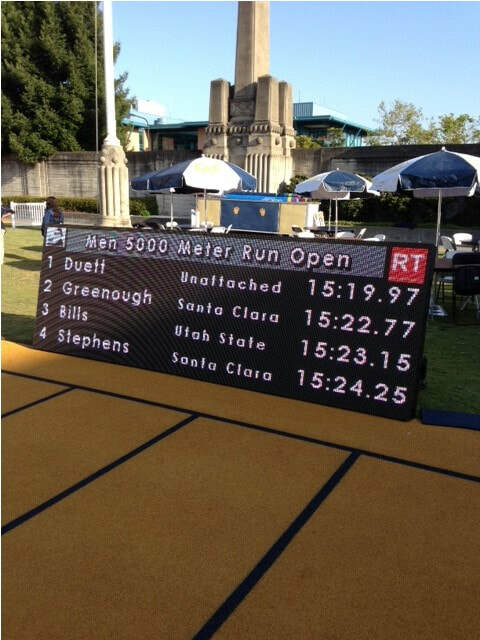 Allows for “normal” conversation and communication between clerk/finishline/pressbox/timer/starter, etc. Wireless system is “NFL style” and specially encrypted. 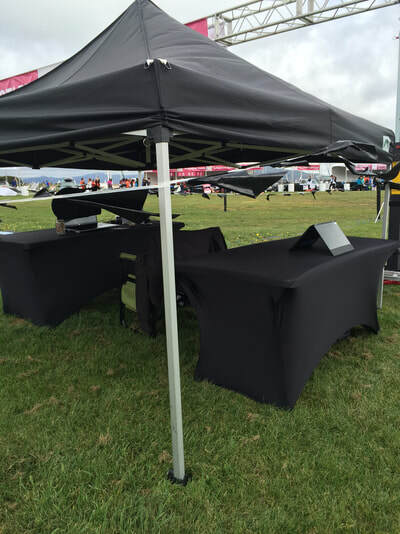 Portable Public Address system available. 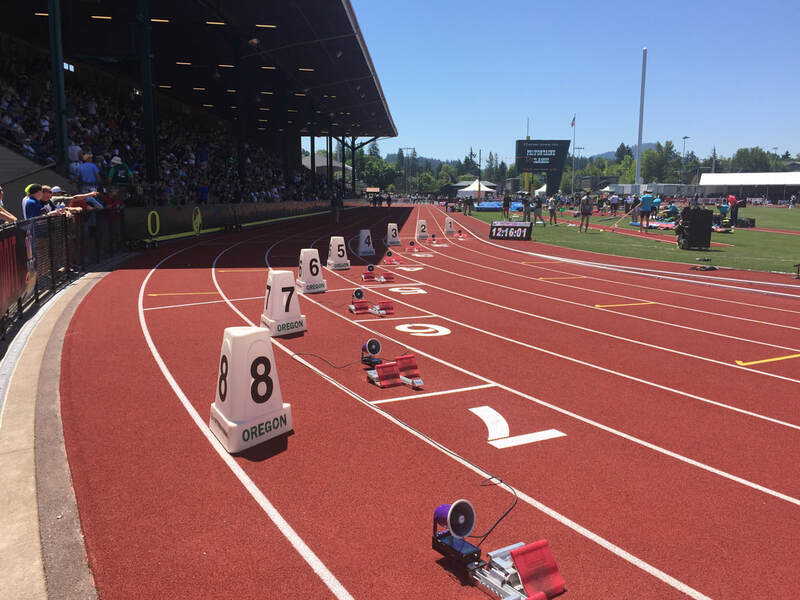 Utilizes electronic bang as used at the Olympics, World Championships and most international competitions. Quiet Honda generators and battery packs with power inverters. Most of the items listed above are with us at each venue within California. Please inquire if you have a special need for a particular item or application. Shipping charges may apply for additional equipment requested outside of California.